Create a one-of-a-kind living space with custom home construction and remodeling services from Hugh Bauers Contracting. We specialize in providing full-service home improvements and renovations as well as new home construction.We offer an extensive variety of remodeling services, including home additions and new siding installation, as well as new windows, and custom bathroom and kitchens. As an owner operated business, Hugh Bauers Contracting provides top-quality construction services and excellent attention to detail. Free estimates are our standard and our team is known for honesty and integrity. Choose Hugh Bauers Contracting for all of your construction needs and put our expert experience to work for you! New Home Construction At Hugh Bauers Contracting, we are a full-service contracting company offering complete new home construction services.We provide everything from framing and foundations to windows, siding, roofing, and trim. We also install all electrical and plumbing systems, as well as complete HVAC. To provide you with the best comprehensive service, we have a team of professionals that offers full project management. Contact us today at (631) 750-2598 for a free estimate!!! So our upstairs bathroom was really, really small. Barely enough room for one person to be in it. So we decided since the bedroom adjacent to this bathroom was also so small it would only fit a twin size bed and a very small dresser, that we wanted to knock down a wall and make the bathroom larger. We contracted with Hugh Bauers Contracting, and they made it happen. Now instead of having to rooms that are basically too small for comfort, we have a really nice bathroom with everything updated and modern. Hugh Bauers Contracting built our new home. They did everything that we asked of them, and some. They did an excellent job in using all the materials in the kitchen and bathrooms that we had asked for. Since we are first time homeowners we couldn't be happier. Hugh Bauers Contracting, helped make our dreams come true. I wanted to remove our old yucky windows in the front of our home, and have new windows with bench seats installed. Hugh Bauers Contracting did an excellent job, and understood exactly what I wanted. I wanted to add an additional room onto the back of our house as my mother in law was getting older, and we wanted her to move in with us, but wanted to give her some privacy of her own. We contracted with Hugh Bauers Contracting to do the work. They did a fantastic job. 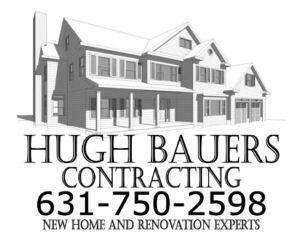 Do you have any experience using Hugh Bauers Contracting? If so, please rate your experience and let others hear about it using the form below.